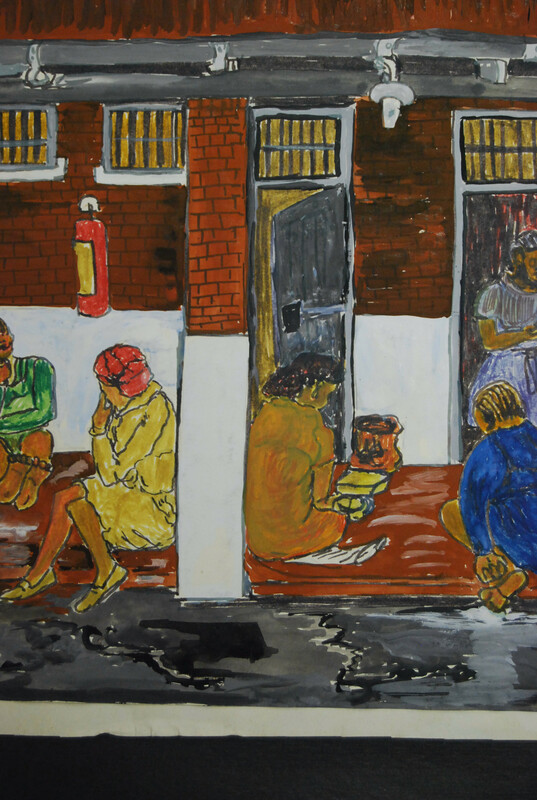 A new permanent exhibition of paintings, sketches and detailed notes about life in Women’s Jail was unveiled at Constitution Hill, Johannesburg last month. 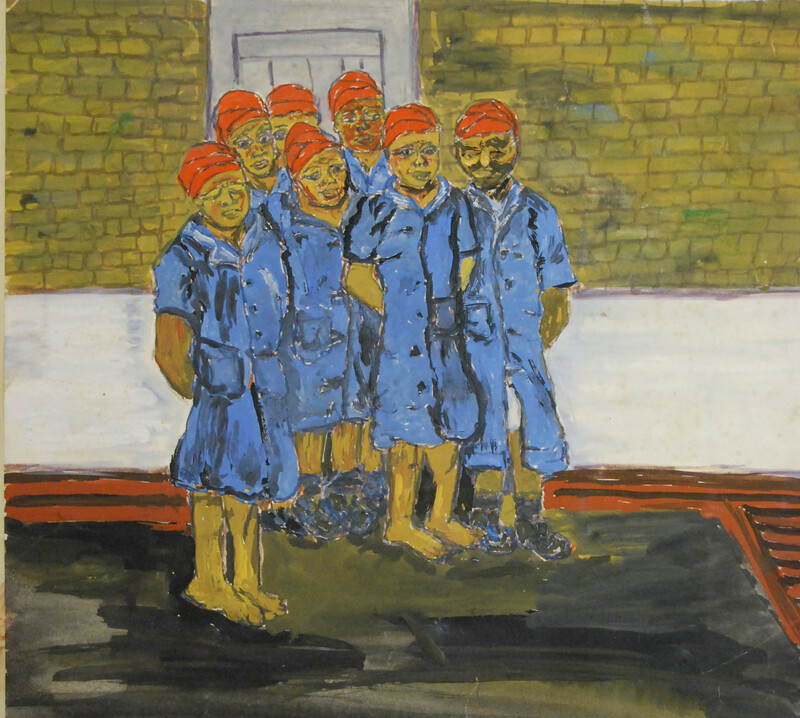 The exhibition, titled Prison Diaries after her book by the same name, showcases anti-apartheid activist Fatima Meer’s artwork during her incarceration in 1976. She was detained in solitary confinement in Women’s Jail (now part of the Constitution Hill complex) along with ten members of the Black Women’s Federation, an organisation banned by the apartheid government. According to the accompanying statement, Prison Diary “captures some of the day-to-day stories and private moments of women who were detained and imprisoned during the liberation struggle of South Africa.” And on the opening night, it was stark the how there was a presence of black women who were not strictly defined as political prisoners, but were confined to the Women’s Prison. In remembering the anti-apartheid struggle, certain names (often men) occupy more space in our collective memories–both globally and within South Africa. But as many of Meer’s ex-inmates attest to, the struggle was not theirs alone. Sibongile Mkhabela, a struggle heroine, ex-prisoner and now the CEO of the Nelson Mandela Children’s Fund explained that black women who came to Johannesburg to find their husbands during apartheid were found to be breaking the dompas rules by being black in white areas past a certain time. Those who didn’t have the required bail money were forced to the Women’s Jail. The importance of their roles in the liberation struggle–in a way, political prisoners too–was highlighted by Constitution Hill archivists and the women who were imprisoned there. Prisoners in uniform. Painting by Fatima Meer. Taking it upon herself to visually document moments of intimacy, caring and ordinariness in prison, Meer was an archivist artist. Many of her ex-cellmates were present at the emotionally charged exhibition opening evening. Whether it was inmate’s favourite activity of braiding each other’s hair, or of embracing each other under the guise of combined prayer time between Winnie Madikizela-Mandela’s yard and Meer’s–the moments showed solidarity through the corrugated tin and cement of the jail blocks. Rebellious and intelligent, Meer used the tools at hand for deliberate political purposes–nowhere in her paintings do you see flowers. What you do see are fine brushstrokes and raw sketches recreating life inside the Women’s Jail for black women political prisoners. 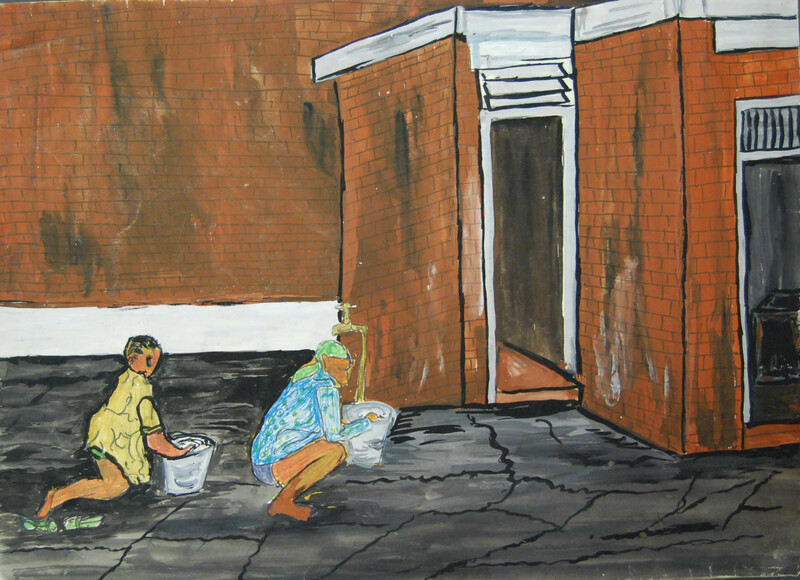 There are women playing cards, soaking up sun on the verandahs of the cells, reading bits of newspapers and plaiting each other’s hair–both enjoyable, and a time of bonding for the inmates, according to Meer’s description of the work “Favourite Pastime.” In The Outside series of works, Meer turns her gaze to the world outside the high, confining walls. Ponte tower, as domineering as it is today, stands in the horizon. The grasp of freedom seems perilously close and the greens, in particular, jump out at you–but still, the dull brown prison wall predominates the painting. Women who are faceless in the current conceptions of struggle and the fight for liberation from apartheid in South Africa is what we need to see. The exhibition stands as a reminder of what the prison looked like in its most vicious years. It stands as a testament to not forgetting the past–so we can feel the texture of the pain from the women who were imprisoned here, understand their everyday experiences and break with purely masculinist notions of political struggle and prison life.